Here in the Mid-Atlantic region of the U.S., we are having a snow storm and most offices are closed! So that means a lot of people get to stay home from work and snuggle by the fire and watch movies all day…. The first thing to think about is that you now have ALL day to get in a great workout. AND you should really reward yourself by cooking up (and eating!) these amazing cupcakes. They are so delicious and perfect to pack in your lunch bag as an afternoon snack. If you're like most people, during a workday you probably experience a dip in energy around 2:00 – 3:00 pm…right? Perfect time to eat a cupcake than, right? Do the workout routine (see below). Then eat a cupcake (recipe below). Tone up your legs, arms and abs with this simple home workout routine! For each move, the lower you can go, the better. Challenge yourself! Visualize your goals, put on some motivational tunes and rip this workout routine a new you know what! Do 5 rounds of each circuit. Give yourself 10 seconds between each exercise move. Give yourself 30 seconds between each round & circuit. Do 10 – 15 reps per move. *30 secs rest before moving onto Circuit B. *30 secs rest before moving onto Circuit C.
Good Job, You're Done! Now go eat a cupcake! Preheat your oven to 350˚. Whip up the cupcake batter below. And bake away! These muffins are nutrient packed, gluten-free, dairy-free, wheat-free, sugar-free, grain-free and a perfect post or pre-workout snack! Measurements may vary according to your taste and preference, so have fun with it and tweak the recipe as you like! Preheat oven to 350˚, spray a cupcake tray with cooking oil, and get out your muffin tins (I use silicone tins, they're awesome!). Combine the coconut flour, salt, baking soda, and cinnamon in large bowl. Whisk together the eggs, coconut oil, and vanilla extract in a bowl and blend well. Mix dry ingredients into wet ingredients. Slowly add coconut milk until reaching a cupcake consistency and thickness (should be like pancake batter). Now add 6-8 scoops of pure stevia extract powder (very potent, so I mean the very tiny scooper that comes in your pure stevia extract powder bottle). Taste the batter, and if you want to increase the sweetness, add a scoop or two more. 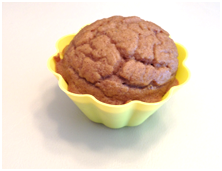 Once batter is ready, fill each of your muffin tins about 90% full with the batter. 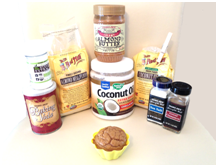 Dollop a teaspoon of almond butter on top of a few muffins for some fun and variety! Put muffins in middle rack of oven for about 20-25 minutes. Cool and frost with almond butter! Yum!